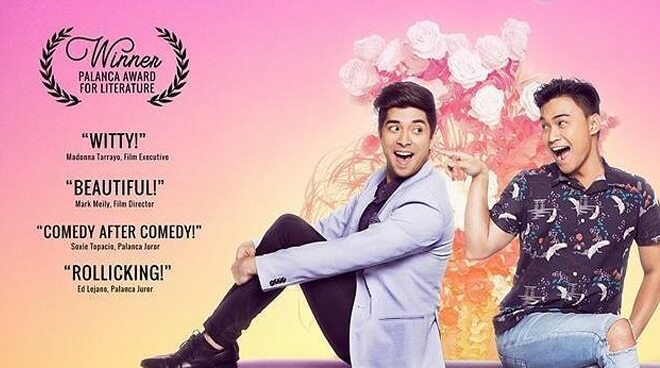 Joross Gamboa and Edgar Allan Guzman shine in this unexpected kind of love story. 5. It's definitely no copycat. When it made the final cut of the Metro Manila Film Festival, critics were quick to compare Deadma Walking to last year's festival top runner Die Beautiful. Both movies had lead characters that were gay best friends and death was a constant theme throughout the story but that’s where the similarity ends. Based on a Carlos Palanca award-winning story, Deadma Walking continually surprises with its scenes of delicately balanced comedy and drama. 4. It's a star-studded story. Aside from its talented cast, Deadma Walking is also a virtual stream of celebrity cameos in every scene. Not that they need to rely on star power to support an already solid storyline, but it's an added delight to see familiar faces drop by even if just for a second or two. Bonus points for the viewer if you can recognize the more than 20 cameos in the film. 3. It reminds us how much we should love our family. In the movie, Dimples Romana returns to the country to make peace with her estranged brother Joross Gamboa only to arrive just in time for his eulogy. The two actors play siblings so convincingly that it almost makes your heart ache when she thinks she's arrived too late to give him a hug. 2. Joross Gamboa shows that when it comes to acting, subtlety is king. In real life he may be a loving husband and a dad, but on the big screen Joross made us sympathize with his role of successful but closeted ailing businessman John Samson. Even though he may sometimes look overshadowed by his flamboyant BFF Mark (played by Edgar Allan Guzman), Joross made his mark in his own quiet way, by being the quiet, prim, and proper gay man his role called for him to be. 1. Edgar Allan Guzman is a lovely gem. Playing the role of stage actor and ever supportive best friend Mark is EA who manages to give so much more than what his role calls for with his spot-on timing, hilarious mannerisms, scene-stealing antics, and an impressive way of pulling all that off naturally that we almost forget that offscreen he is one of the most masculine actors we know. To sum it up, both Joross and EA'S performances as best friends John and Mark have the capacity to make them serious contenders for acting awards before the year ends. Make sure to watch this film for the engaging story and the deliciously entertaining acting from these two brilliantly underrated actors.